Patience means you wait for your turn or the right time to do something without getting upset. It is a necessary part of life. Patience helps you to respond in the right way when things don't go the way you'd like. 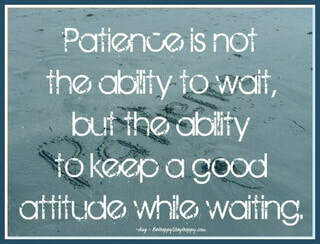 A patient person responds to situations that take longer than they want with a positive attitude and outlook. This will make life better for everyone involved: at home, at school, and in the community in which you live. Patience isn't something that develops over night. You have to learn to be patient by practicing it every day. Start small. Wait calmly for your turn. Wait quietly to be called on by the teacher. Don't shove or push in line to try to get in front of someone else. Patience is a gentle, forgiving attitude toward someone — even in the face of blatant disobedience. Responding with patience isn't easy. At times it will go against everything we're feeling, but patience is worth the effort it takes to cultivate. It strengthens relationships, feeds our joy, and ushers peace into our lives. 2. Not complain when I don't get my way. 3. Accept what cannot be changed. 4. Use my time wisely. 5. Try and try again.